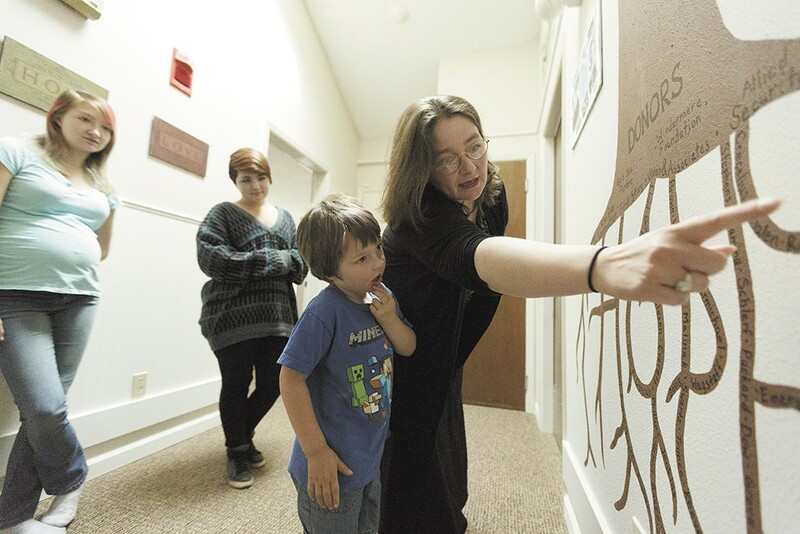 Angela Friedrich shows her 5-year-old son, Bert, a mural representing the donors who contributed to Family Promise of Spokane, which has helped the Friedrich family. Angela Friedrich has lost count of all the places she and her children have spent the night in the past year. There have been couches, shelters and the motor home where it was so cold she could see her own breath. In just the past 60 days, Friedrich and her three children — Theresa, 17, Marianne, 15, and Bert, 5 — have called a dozen churches home for a few nights at a time. The Friedriches are hardly alone. In Washington, 61,000 children were homeless in 2012 and 2013, according to the National Center on Family Homelessness. Spokane County's point-in-time count on Jan. 29 found 1,033 homeless people, including 121 families with children, a 17 percent decrease from the previous year. For families, the downward spiral into homelessness is rarely rapid; for Friedrich, it was more of a slow slide. "I lost my job and was trying to get out of a negative situation with my son's father," says Friedrich. "We were evicted and struggled to find housing. It was just one roadblock after another. It was really difficult to find a job when we weren't stable anywhere." A house of their own always seemed just around the corner — just an application, an approval or a caseworker assignment away. But everything is more difficult without a steady place to stay. "I started filling out the application for assistance through the Salvation Army at the end of August," Friedrich says, "and it took me months to get through all the red tape." Rapid Re-Housing programs sprung up around the country in 2009 with the cash infusion from the federal economic stimulus package, aimed at stanching the flow of families from the suburbs to the streets in the wake of the mortgage meltdown. The National Alliance to End Homelessness found that 87 percent of families helped through these programs never return to homelessness. "In Spokane we've seen less than 1 percent of families return to the system within six months," says Sheila Morley, community homeless program manager for the city of Spokane. Last year, the city invested $900,000 in Rapid Re-Housing and served 400 households. This year, Morley says they hope $1.1 million will serve 500 households. Boise was an early champion of Rapid Re-Housing, with its Charitable Assistance to Community's Homeless program that began in 2006 and transitioned 65 families into apartments last year. "Most of our school jurisdictions, each school shows between 350 and 700 kids experiencing homelessness," says CATCH Executive Director Wyatt Schroeder. "Statewide, that number is around 6,000. These are individual children that we're trying to help." Rapid is a relative term, though. Schroeder says the waitlist for CATCH is about six months. In Spokane, Rapid Re-Housing is structured more as a quick boost than a long-term transitional program. While CATCH pays up to six months rent, Spokane's program helps only with move-in costs, making the low rate of families returning to the streets all the more impressive. "Ideally, families are housed within 30 days of becoming homeless under Rapid Re-Housing," says John McGah, senior associate at the National Center on Family Homelessness. That's rarely the case in practice, though. McGah says it often proves difficult for the programs to expand, due to the availability of suitable housing and willing landlords. Catholic Charities Associate Director Gene DiRe says 102 families were helped from January through March. DiRe says wait times vary because funding fluctuates through the year based on grant cycles. In Spokane, Rapid Re-Housing funds cover application fees, security deposit and a portion of the first month's rent and are available for up to 30 days. The intake assessment is simple to fill out. Click through a couple of screens, check some boxes indicating where you've been sleeping at night, and it spits out an option — if there is one. "Living in the home of friends or relatives, or in a self-owned unit that is in the midst of foreclosure, does not meet the eligibility criteria for application to access these re-housing dollars," says the final screen of Spokane County's centralized intake assessment if you select "Temporarily living with a friend or relative (aka couch-surfing, not on the lease, not an owner of the property)" as your current housing situation. "Sleeping in my car" produced the same response. To be eligible for programs like Rapid Re-Housing, you have to get really homeless first. 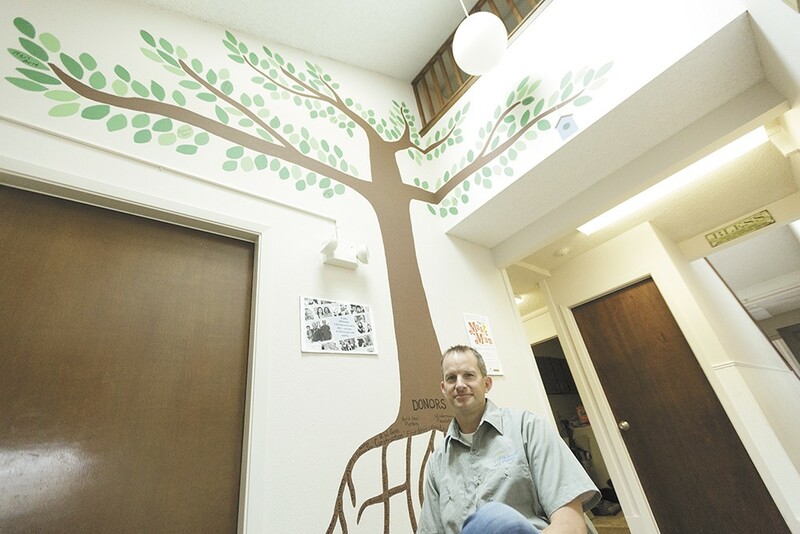 Family Promise of Spokane Executive Director Steve Allen ended up connecting the Friedrich family with a friend of his who had a home available. Many Rapid Re-Housing clients have a black mark marring their rental history. If they can't find a place to rent within the 30-day window, they lose the funds. Others are approved but end up waiting for months due to a lapse in funding. "There haven't been any fluctuations or cuts to funding. We just have more people eligible for Rapid Re-Housing than there are funds," says Jonathan Mallahan, the city of Spokane's community and neighborhood services director. Mallahan says the city hopes to budget more money in the future, because the program seems to be working so well. They'll also need to find more landlords willing to take a chance on tenants who don't look perfect on paper. "The landlords wouldn't even meet with them because of the eviction she got when she left her domestic violence situation," says Steve Allen, executive director of Family Promise of Spokane, who has been helping the Friedriches search for housing. Some Spokane landlords have had bad experiences with older rental assistance programs that have left them wary. "I've done Section 8 and that's been a disaster," says West Central landlord Rick Gagliardi. "There's no checks and balances." Teetering on the brink of homelessness as summer turned to fall and fall to winter, Friedrich began to panic as the family's stopgap housing options dwindled. By December, she and her children were living in a 1970s Winnebago motor home in a friend's yard. "We had no running water, no heat, and this was in the dead of winter," says Friedrich. From there they went to the 18-room Union Gospel Mission, which Friedrich says was consumed with video education courses on how to be a responsible renter and a good parent. After the UGM, where the maximum stay is 90 days, Friedrich was accepted into the Family Promise program. "We've been waiting for the county Rapid Re-Housing. As soon as we applied and got approved, they froze everything and did a restructuring," says Friedrich, who was approved for funds three months ago. "I've just kind of been sitting in limbo." Friedrich's housing purgatory hasn't been all bad: She found a job with a photography company and has connected with a support system through the church communities that participate in the Family Promise program. The year of uncertainty and waiting has taken a toll, though. Marianne never managed to catch up in biology or trigonometry after switching schools; Theresa soon will be a mother. Bert doesn't know the family is homeless, Friedrich says, and the older girls have been careful never to use the word around him. "I just want to be able to send my kids to their rooms," says Friedrich. "I really, really miss it!" Friedrich finally got the green light to use her Rapid Re-Housing funds last week, and within days she had appointments lined up all over town. Even with the funds in hand, though, housing remained elusive. "Two or three places she looked at, no one would give her a second glance," says Allen. "Their situation was really not her fault, but it's been hard for her to overcome that." Then she went to view the little blue house owned by Gagliardi, who is a friend of Allen's. "She let me know she had an eviction, and as a landlord, that's very, very bad," says Gagliardi. "If a judge has to throw you out of a house, that's a big red flag." But Gagliardi says he is willing to give the Friedrich family a second chance because Allen vouched for them. "Several years ago the Salvation Army approached me about another woman, they recommended her and it worked out great," says Gagliardi. "I would encourage other landlords to work through an organization with these tenants."